Many patients in care homes and residential facilities are at risk of injuries resulting from falls from their bed, so it's important to ensure measures are in place to minimise this risk. The Sidhil Grange Side Rails for Divan Beds are designed to prevent bed falls, and are intended for use with divan style beds. Height adjustable with a cross-bar for easy installation, these rails provide a simple and effective fall reduction strategy. A major injury cause in care homes is falling out of bed, so it's important to have measures in place to minimise these risks. 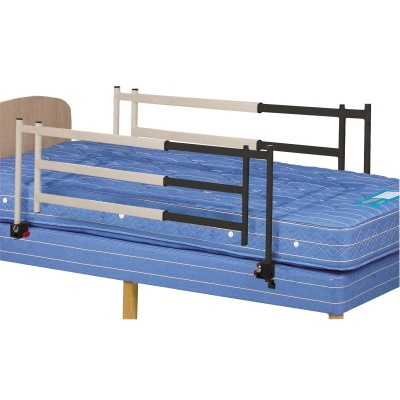 These side rails will help to prevent these falls, and are extendable to suit a number of different divan beds. Please be advised that the Sidhil Grange Side Rails for Divan Beds is usually delivered within 1 week of your order being placed. We would advise you to consider this delivery estimation before placing your order. For more information, please contact our Customer Care Team at 020 7501 0592.